Tibetans kicked off the annual Shoton Festival, or Yogurt Festival, on Monday by worshipping Buddha, taking in traditional Tibetan operas, and enjoying picnics in southwest China's Tibet Autonomous Region. 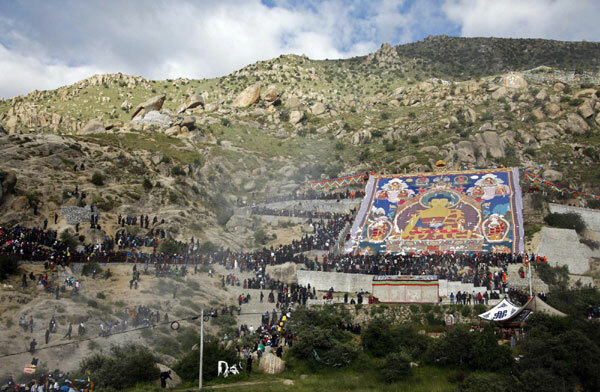 The opening ceremony attracted tens of thousands of people to the Drepung Monastery located in the western part of the region's capital city of Lhasa. Tsering Donggar, dressed in Tibetan costume, offered hada, a piece of silk meant as a greeting gift, to the Buddha of the monastery with his wife. "Every year the people of Lhasa gather someplace, either in Drepung Monastery or the Norbulingka Garden," said guide Tsering Donggar. Shoton Festival, which literally means "yogurt banquet festival," is one of the most important festivals for Tibetans. It dates back to the 11th century when it began as a religious occasion for local residents to offer yogurt to monks finishing mediation retreats. Around the 17th century, it evolved into an occasion featuring Buddhist rituals, Tibetan opera performances and other forms of entertainment. Like all Tibetan holidays, the exact date of the Shoton Festival is not fixed, though it almost always falls in August. Gyatso set up two white-and-blue tents at 6 a.m., and tied colorful draperies to surrounding trees. He prepared to spend the seven-day festival in the tents with his family, watching Tibetan operas, playing cards, eating, drinking and sleeping on the grassland. "Tibetan New Year and the Shoton Festival are the two most important festivals for us," Gyatso said. Under a theme of "Happy Lhasa and Colorful Shoton," people can enjoy 18 activities in six categories. A beer festival and Tibetan opera performances were also held at the Norbulingka Garden.